The U.S. Army Air Service took delivery of 107 Standard (Aircraft Corp.)-built O/400s from September 1918 onwards. These 100-ft. span "Night Bombardment-Short Range, Type XII" bombers were powered by two 350-h.p. Liberty 12-Ns. FLEET AIR ARM. Photographs of operational aircraft in service with the Fleet Air Arm between the wars are comparatively rare. 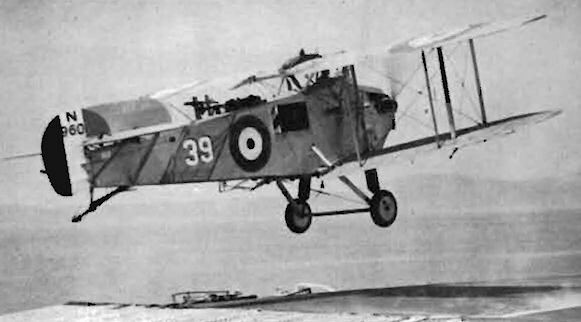 Reader D. C. McKinnon of Padworth, Berkshire has submitted some fine "action" photographs of which these Avro Type 555 Bison Mk. IIs are but two. The Bison Mk. II was a four-seat deck-landing. Fleet Gunnery Spotter (one 450-h.p. Napier Lion Srs. II). From 1922-7. forty-one Bison Mks. I and II were built. 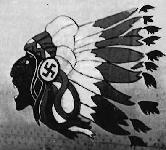 Photo: a Bison Mk. II (N9601) of H.M.S. Courageous, about 1925, fitted with port amidships, gunnery practice sleeve-retrieving windlass. Unusual "G-5417" (ex-F-5417) temporary civil registration (later G-EAAW) was applied initially for the London-Brussels thrice-weekly air service (twelve passengers, two crew) which started on 22nd September 1919. This O/400 (contractor unknown) had two 360-h.p. Rolls-Royce Eagle VIIIs. 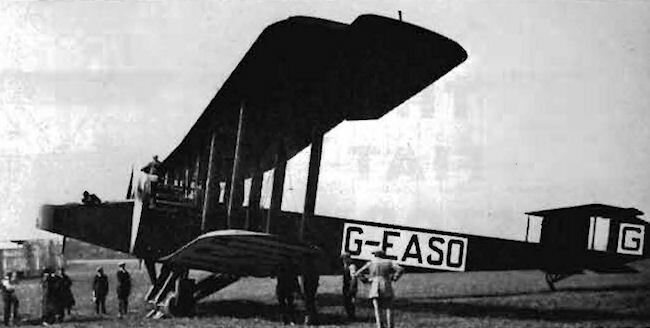 Prepared for the abortive May 1919 "Air Cargo Race" (L10,000) - organised by the Daily Express - was this most powerful of all O/400s, G-EASO, fitted with two 450-h.p. Napier Lion Srs.IIs.